HAMPTON, Va. (August 31, 2018) — Hampton University, a beautiful historic college located in the city of Hampton, Virginia, is home to over 4,600 students as well as hundreds of faculty and staff. As the fall approaches, the students will be flocking back to the campus with new classes, new friends, new teachers and a new technology system in place to help combat the threat of gun violence on or near the school. The Hampton University Police Department provides around the clock services 7 days a week, 365 days a year. The department has 63 authorized positions, including 38 state certified police officers, 10 security officers, 8 telecommunication personnel, and 7administrative support personnel who diligently to keep the students safe. Unfortunately, the current reality is that gun violence and the threat of active shooter events has sharply increased around schools and universities, as well as in neighboring urban communities. Students at Hampton may be so busy starting the new year that they are unaware that ShotSpotter technology is now hard at work behind the scenes on their campus to help quickly detect and alert security professionals to any sound of gunfire. ShotSpotter detects gunfire accurately, provides increased situational awareness for first responders, and integrates seamlessly with existing security systems for enhanced campus/facility security. 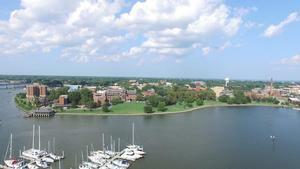 At Hampton University, ShotSpotter acoustic sensors have been installed around its 314 acre campus. Hampton’s location is beautiful – surrounded by water on three sides – but that also means that sound travels fast. Glover expects ShotSpotter to help quell rumors and misinformation that may occur because individuals setting off firecrackers or sounds carried over water that sound like gunfire from other parts of the city,. The accuracy of the technology will assure that officers know if it is gunfire or other loud noises and then pinpoint the location of where the shots were fired. Hampton University is a member of the IACLEA (International Association of Campus Law Emforcement Administrators).